Arnout De Cleene (°1986) works at the Dr. Guislain Museum in Ghent (Belgium) as a scientific employee. He studied cultural studies at Maastricht University and did research on outsider literature at Leuven University. The Dr. Guislain Museum is located in the city of Ghent (Belgium). 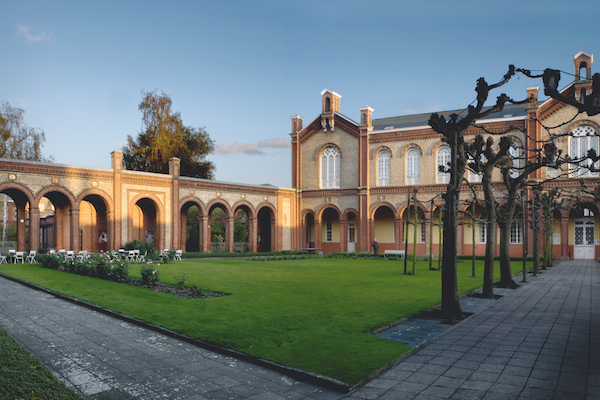 The museum can be found in the well-preserved buildings of Belgium’s first psychiatric asylum. At first sight one would consider this an ideal situation as the museum specializes in the history of psychiatry. The Dr. Guislain Museum opened its doors in 1986. In those days visitors needed to go to the attic in one of the old buildings of the Hospice pour hommes aliénés. The Hospice was a specialized psychiatric institution founded in 1857. The institute was commonly namedHospice Guislain after its founder, Belgium’s first psychiatrist Joseph Guislain (1797-1860). Today, the Dr. Guislain Museum encompasses a permanent exhibition on the history of psychiatry, a broad collection of outsider art and temporary exhibitions on subjects related to the history of psychiatry (such as melancholia, trauma, shame, etc.). The museum tries to be a place where scientific research and expertise (on psychiatry, mental illness, madness, etc.) can be translated into (mostly visual) presentations that aim to reach a large and diverse public. One of the intriguing and problematic aspects the museum continuously is confronted with is the following: the building used in order to present the exhibitions seems to interfere with what is being shown and how it is interpreted. The museum’s central court and one wing of the nineteenth-century buiding. The court has a green lawn, several trees, roses and a terrace. © 2012, Guido Suykens. The building of the Hospice Guislain indeed is one of the most telling “objects” that can be found in the collections of the Dr. Guislain Museum. The different wards, the chapel, the remnants of a fire in 1928, the gardens, all offer overwhelming visual historical evidence. At the same time, however, the building is being used in order to house several exhibitions. It thus also encloses the objects, artworks, books, testimonies, etc. on display. For curators, visitors as well as for the items on display, this situation creates opportunities, as well as frictions and difficulties. Not all objects or items used in the exhibitions are directly connected to the history of psychiatry. However, being placed in a context that so to say breaths psychiatric knowledge and actions, the objects are interpreted as belonging to the history of psychiatry. They kind of become psychiatric themselves. As such, everyday objects are enriched and charged with meaning: by putting them in the Hospice Guislainthey immediately become relevant to the history of psychiatry. However, what can be considered as an enormous opportunity – being located in the building of a well-known psychiatric institution – also can be looked at differently. The building indeed is a pervasive framework from which it is hard and seemingly impossible to escape. It is very difficult to tell a story inside the Dr. Guislain Museum that does not immediately acquire psychiatric interpretations. As such, the range of potential meanings an object, artwork or story can acquire, is not only enriched, but also limited, precisely because they are presented in the Hospice Guislain. To put it bluntly: if you put a portrait on display in the Dr. Guislain Museum, it can become a psychiatric portrait. If you see an artwork, you’ll perhaps think of it as outsider art. If you see a pencil on the museum floor, you just might think it was a mad(man’s) pencil. 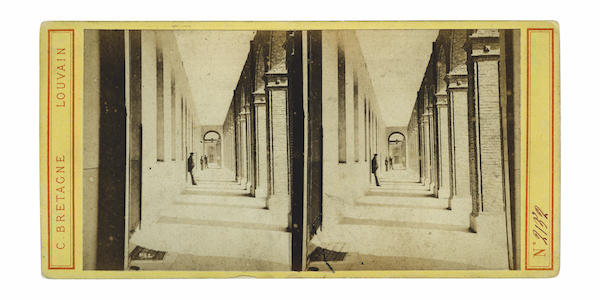 Early twentieth century picture representing one of the corridors adjacent to the central court. Halfway the corridor a man is leaning to the wall. At the back two more figures are visible. The photograph is duplicated and placed on a piece of yellow paper on which the following inscriptions can be found: N°2132, C. Bretagne, Louvain. The light that shines through the windows of the Hospice Guislain and falls on the objects and stories on display, colours them in a specific way. The spatial structure of every exhibition necessarily repeats the ground pattern of the wards. The bricks and metal fences order and organize, limit, colour, direct and produce the meaning that the public can ascribe to the gathered objects. The building provides the visitor with a tangible context. It can be gazed at, walked upon, strolled through, felt. The Hospice Guislain indeed is an object within the context of the history of psychiatry as well as it is the context in which items relevant to that history are presented. It mirrors the mechanisms of a museum – as an institutional space that orders, selects, omits, sanctifies, contextualizes. As such, the Dr. Guislain Museum, as a (former) psychiatric and (present-day) cultural institution, is highly visible. The question curators of the Dr. Guislain Museum time and again are confronted with is whether one can one escape from the institutionalizing effects the walls, bricks, wards and architecture seem to have (and had in the past). And if so, whether this is something one really wants. Would it be possible for the Hospice Guislain to become a dynamic, malleable environment, despite the sturdiness of its walls? And would it be possible to conceive the relationship between the public, the curators and the material context of the exhibitions other than in terms of visibility? 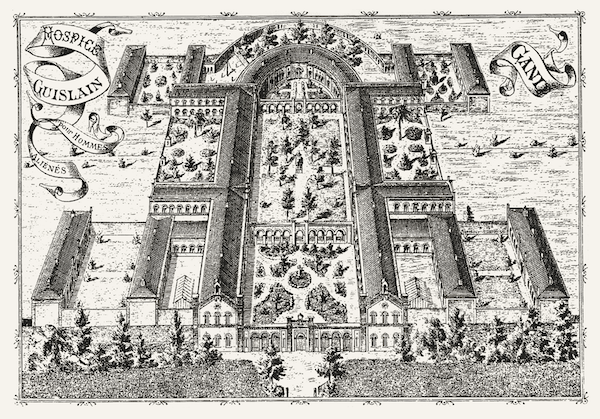 Black and white nineteenth century drawing of the complete Hospice Guislain site. Collection Dr. Guislain. Carved in the bricks of the outside walls of the Dr. Guislain Museum one can find crosses, dates, names, etc. It remains unclear what caused these inscriptions on the museum’s surface: man-made, weather-influenced or other origin. It is impossible to know who has written these signs, what they were supposed to mean, to whom they were directed. These inscriptions could be written by patients, museum visitors, doctors, gardeners, etc. An inscription reading  could have been written in 2014, and vice versa. A name can be the tag of a woman, or the name of the relative she longed for. Twenty-two vertical stripes are twenty-two days since admission, and they are twenty-two birds that flew across the sky. They are twenty-two stripes written by twenty-two different persons, referring to twenty-two different things. And so on. We often do not pay attention to these brittle signs. Our gaze is directed towards the items on display. History should be looked at intentionally, so it seems. There’s little, not to say, no space left for an unintentional encounter with our past. Perhaps this is what can be derived from the inscriptions represented and talked about here: that what matters in the Dr. Guislain Museum is not only what can be looked at from behind safety glass. It is also what becomes clear when the eye drifts away to the space that is not curated by the museum staff. The inscriptions also invite us to reflect on their more general implications. The building of the Hospice Guislain in which the Dr. Guislain Museum is housed, literally bears the stamp of its public. The environment in which the exhibitions take place, is inscribed by the visitors that have walked the grounds of the building for more than 150 years. The walls are eroded, inscribed, altered, and waiting to be deciphered and interpreted. The reader perhaps will recall the famous distinction made by Roland Barthes between ‘textes lisibles’ and ‘textes scriptibles’.1 The first texts were those that seemed to have a fixed meaning one could accept or reject. The second kind of texts needed some more work and energy. Those texts kind of were written again when being read. Can the Museum Dr. Guislain be considered such a ‘texte scriptible’? Would it be possible to think of a history of psychiatry – of histories of psychiatry – presented within the Dr. Guislain Museum, as a museum that is (re)written while it is being read, curated while being visited, as a ‘musée scriptible’? Arnout De Cleene (2016): The Dr. Guislain Museum: Ten Inscriptions. In: Public Disability History 1 (2016) 2.